Current work on the Tas Property is encouraging and has elevated the property from several small, high-grade zones to a large, gold-copper bulk tonnage target some 2000 x 1000 meters in area. Accordingly, the Company intends to focus its exploration efforts on further developing the historically outlined high-grade zones and to test the porphyry style mineral deposit potential. The Tas Property has been explored intermittently since the 1960’s by a number of different companies. 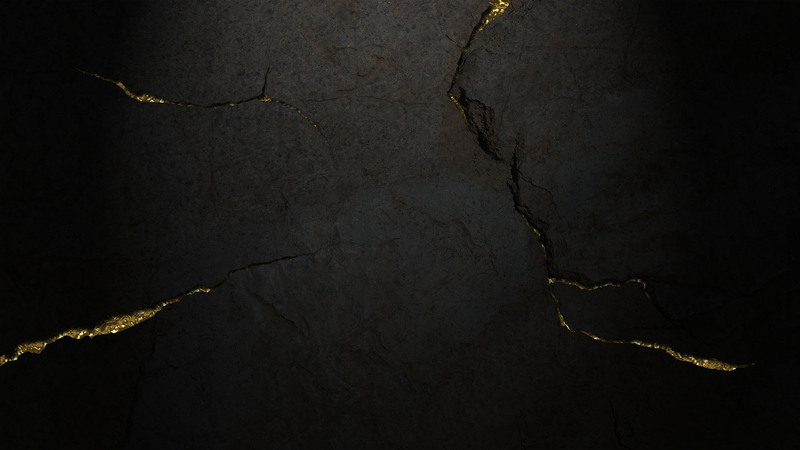 In 1985, Noranda discovered visible gold in quartz-carbonate veins from the Freegold Zone during a property examination. Noranda then optioned the property and completed a program of soil sampling, magnetometer surveys, IP surveys and geological mapping. The following work has been completed on the Ridge and Freegold Zones since exploration commenced in 1985 and prior to 2008. In 2008, Eagle Peak optioned the Tas Property and commenced a compilation of all prior data. Soil sampling work done by previous operators including Noranda was compiled by Dr. Peter Fox, Ph.D., P.Eng. 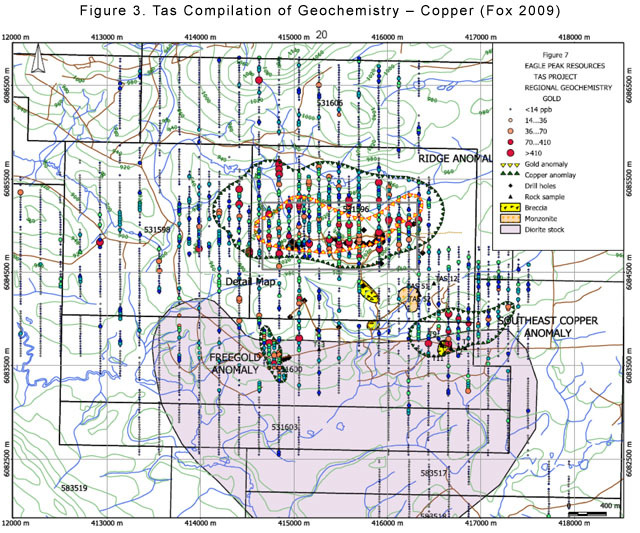 The compiled maps (see figures 2 and 3) show highly elevated gold and copper in soils overlying the Ridge Zone. 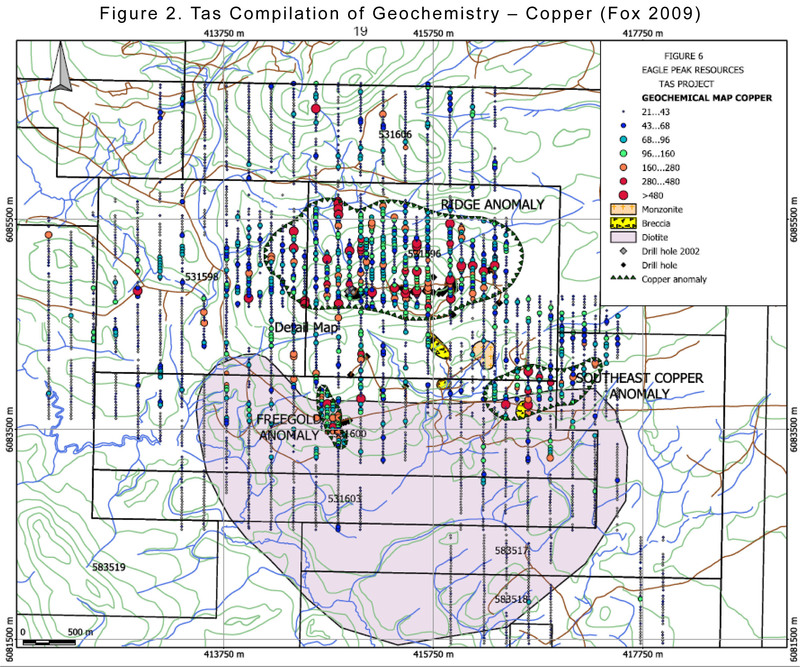 The copper anomaly with >300 ppm encompasses an area 2500 x 1000m having a central area of high gold assays of 1800 x 800m. These anomalies overlie gold mineralized rocks of the Ridge Zone prospects. Eagle Peak cut a 20-line kilometer grid on the property, and completed geological and geochemical compilation and geophysical grid preparation. On June 16, 2010, Canadian Mining Geophysics Ltd completed an airborne geophysical survey of 103 line kilometers over the Tas Property. Geophysical techniques employed were Magnetometer, VLF and Radiometrics. 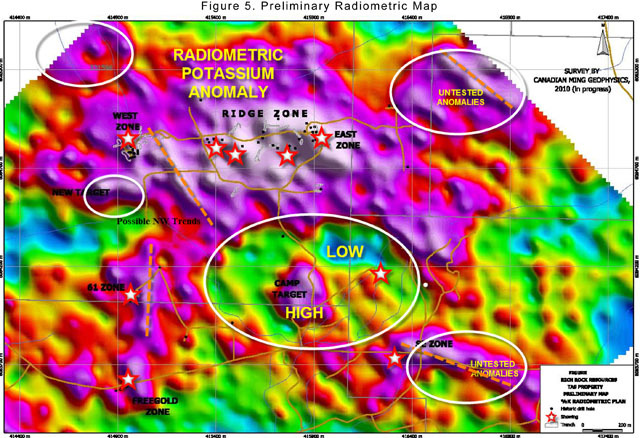 Preliminary results (see figures 4 and 5) for the Tas Property show strong potassic (K) and Thorium Potassium (Th/K) anomalies over the Ridge Zone, the SE copper soil anomaly, and the 61 Zone. The West, 21/19, and East showings are marked by magnetic anomalies and there are new magnetic and radiometric targets. These results are only preliminary and additional interpretation is under way. A preliminary view of the 2010 geophysical surveys confirms a large potassic anomaly consistent with porphyry style mineralization, and smaller potassic anomalies which remain to be tested, and magnetic highs, likely caused by pyrrhotite noted in past drill holes. 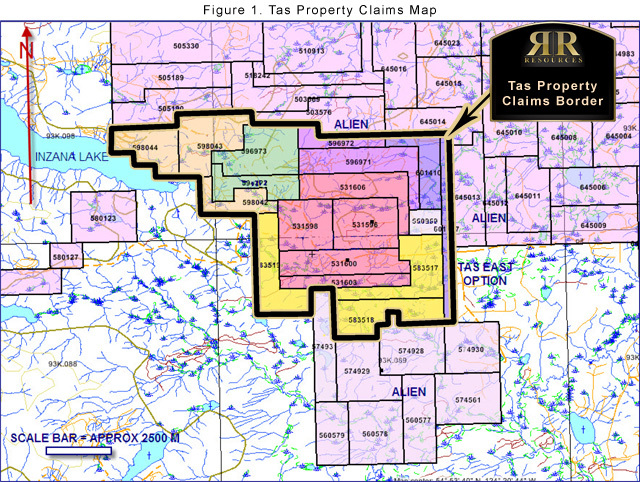 In 2010, Rich Rock Resources retained B.J. 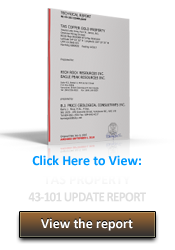 Price Geological Consultants Inc. to complete a National Instrument 43-101 Technical Report on the Tas Property. 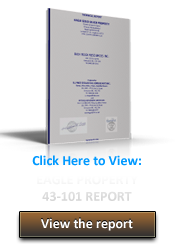 To view this report click here. Soil sampling work done by previous operators including Noranda was compiled by Dr. Peter Fox., Ph.D., P.Eng. 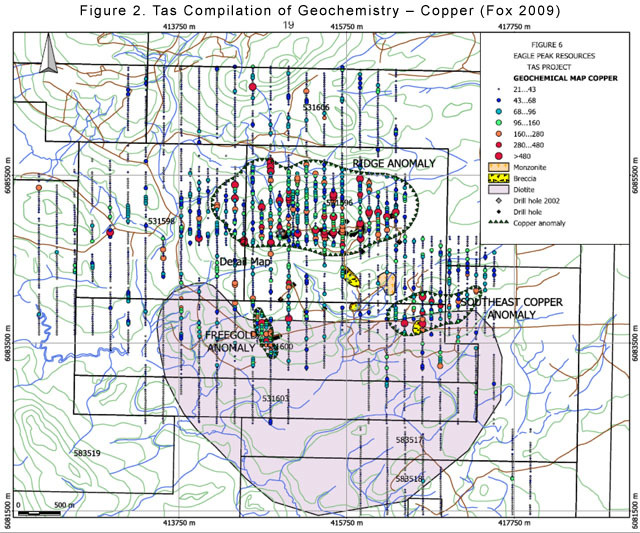 The compiled maps (Figure 2 and 3) show highly elevated gold and copper in soils overlying the Ridge Zone. The copper anomaly with >300 ppm copper encompasses an area 2500 x 1000m having a central area of high gold 1800 x 800m. 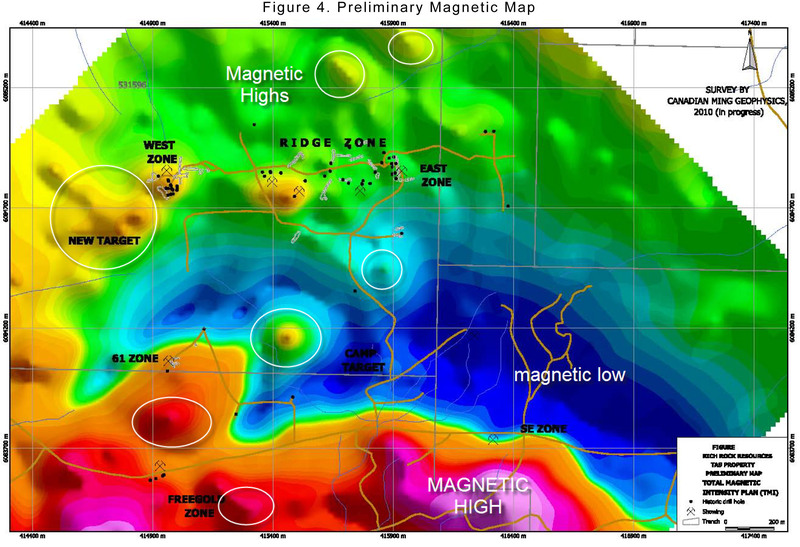 These anomalies overlie gold mineralized rocks of the Ridge Zone prospects. The review of the most recent drilling (by Navasota in 2002) shows significant widths of sub-gram gold values and as yet sub-economic but strongly anomalous copper, with one intercept in Hole TS 06-7 of 46.5 meters of 0.929 grams/tonne gold and 0.07% copper. In addition, a new copper-in-soil target has been identified by the work completed by Eagle Peak. The Southeast anomaly covers an area roughly 1100 x 300 meters. These dimensions suggest widely disseminated porphyry style mineralization in addition to the more local high gold tenor zones developed to date on the Ridge Zone. The presence of widespread copper-gold geochemical targets suggests additional porphyry style targets may exist on the property. This has been corroborated in a preliminary interpretation of the 2010 geophysical surveys, which show broad radiometric potassic anomalies and smaller magnetic anomalies, consistent with other porphyry style properties in the area. 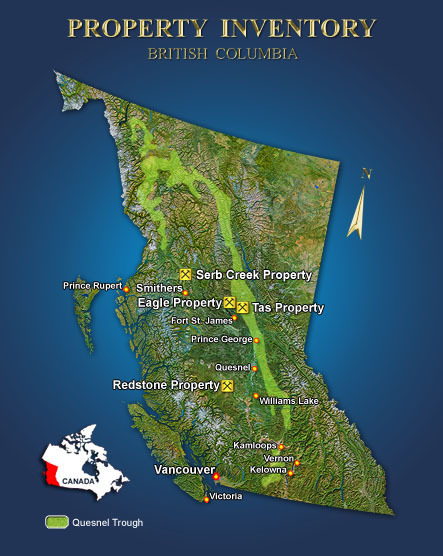 The presence of more local high-grade gold prospects enhances the overall potential of the Ridge Zone and 61 Zone mineralization. Further exploration is clearly warranted to develop and test the targets outlined herein. Continue compilation of older data and maps, drill data and intercepts as the present author has done for the 2002 drill holes. Complete an initial phase of prospecting, mapping and sampling (soils and rocks) for the newer claims north of the original Tas property and westward along the lake. Re-examine old core and assay some section, which were not sampled. Complete a 3D Induced Polarization survey over the central property with orientation lines over the known mineralization seen in surface and in drill holes. Complete drilling of geophysical and geochemical anomalies. Test the new radiometric and magnetic anomalies. Pursue the long mineralized gold-copper sections encountered in the 2002 drilling at the West Zone. Determine if the molybdenum signature is sourced in an intrusive porphyry at depth. Complete some deeper holes on the known targets. Maintain a typical QA/QC program on core sampling such as was done in 2002. Survey in the grid lines and drill collars accurately. Check the survey locations of all past holes where possible. Complete initial prospecting and sampling on the underexplored claims in Inzana Lake area.